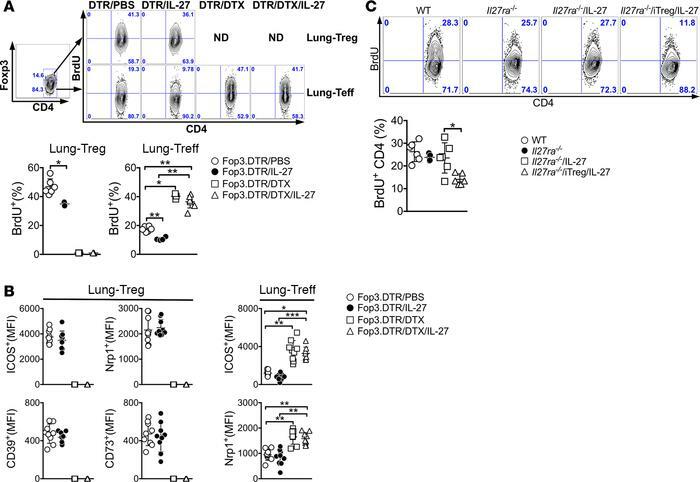 IL-27 inhibits effector T cell proliferation via Treg. (A) Foxp3DTR mice were sensitized with CA in alum adjuvant and intranasally challenged in the presence or absence of IL-27 as described above. DTX was also injected as indicated. BrdU was injected 24 hours prior to sacrifice. BrdU incorporation was determined by FACS analysis as described in Methods. (B) Treg and effector T cell expression of the listed surface molecules was determined by FACS analysis. (C) Il27ra–/– mice were treated as described above. BrdU incorporation was determined by FACS analysis as described. The data shown represent the mean ± SD of 2 independent experiments (n = 4–9). Each symbol represents an individually tested mouse. *P < 0.05, **P < 0.01, ***P < 0.001, as determined by Mann Whitney (A and C) and by Kruskal-Wallis (B) nonparametric test. DTX, diphtheria toxin; iTreg, induced Treg.